As previewed in the last issue, our schedule of activities is heating up (unlike the weather). Read what we have planned and catch up on the events already completed. Check out the profiles of some of our newest members, too. May 5 - Board meeting. Note new location: Wisconsin Club - Country Club, 6200 W. Good Hope Road, Milwaukee. This is the same location where our region celebrated the 50th anniversary finale in 2010. Food and beverage available for purchase. Join the conversation. Meeting starts at 6:30 p.m. All members always welcome. May 6 and 7 - Driver education at Road America. Sign up deadline was May 2. Next DE will be June 10 at Blackhawk. Details about the June 10 event here. May 7 - Drive to the track, tour the track, dinner in Elkhart Lake. If you registered, remember that the details about the starting time and place are here. Registration closed April 30. New! May 13 - Casual dinner. Another opportunity to join other members for dinner. Everyone orders from the menu. The location for the May 13 dinner is especially convenient for members who live in Milwaukee, Racine and Kenosha counties. If you live further away, you get to drive your Porsche a bit more. RSVP required by May 10. Details here. May 14 - Porsches in New Glarus. This is a car show. You are invited to enter or just take a ride to New Glarus to check it out. Details here. May 21 - Paint care tech session. This is a great way to spend a Saturday morning. Dave and Lynn Zimmer, region members, are hosting this at Paintwerks in West Bend. Details here. May 22 - Autocross at State Fair Park. This event includes an introduction to autocross for those who wish to learn what it is about. After completing the introduction, newcomers can participate in the autocross competition in the afternoon. Details about the intro session as well as the regular competitive event are here. Not interested in particpating? We can use your help at the event. Prior experience is not needed. Contact Autocross co-chairs Bruce Tammi or Don Kiepert is you're willing to work at the event. You will find Bruce and Don's contact information on this page. June 4 - Driving tour of waterfalls in Upper Peninsula. See a variety of spectacular waterfalls accessible via nice roads in this follow-the-leader drive, led by Fox Valley Region member Al Curran. The starting point is Eagle River, Wis. Details here. Several Milwaukee Region members have already signed up. Join us. June 10 - DE at Blackhawk. Blackhawk is a great track for the novice as well as the seasoned driver education veteran. Instructors will ride with you and show you how to navigate the track safely. Details here including the link to online registration. Don't delay in signing up. New! June 11 -- Casual dinner at Delafield Brew Haus. Details here. RSVP deadline is June 9. The Social Committee is striving to hold these casual dining events across the area. This event is especially convenient for those who live west of Milwaukee. June 18 -- Spring tour – More details coming. Save the date. Lee Heppe and Jay Heppe are working on the route for our region's annual Spring driving tour of some nifty Wisconsin roads. An all-day drive, participants can opt for a shorter day too if they have things to do in the afternoon. You can easily peel off from the route and head back home at any point. Some opt to do this after the lunch break. Others continue on for a full day of driving fun. June 25 -- Ladies driving tour. The women of the Fox Valley get together every year for a fun day of driving the family Porsche or their own Porsche. Wearing hats like the English Royalty is not required. This year's destination includes great food and shopping. Details here. 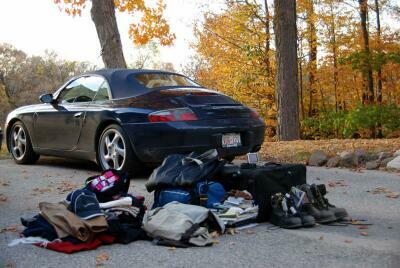 Lynn and Christine Palmer joined the region in March with their 2007 Boxster which Lynn purchased from Napelton Porsche in Westmont, Ill. It’s his first Porsche. Lynn and Chris also enjoy boating. In the summer they keep a boat on Okauchee Lake. They have two daughters who live in Chicago, the oldest was married last summer. Lynn said he’s interested in learning what our region has to offer. Lynn and Chris participated in their first region event in early April at the casual fish fry in Pewaukee. Jim’s job is in marketing. He and his wife have a new baby who is “not doing a lot of sleeping lately,” hence his inability to do a lot of region events at the moment. He hopes to join us for many events as soon as he can. 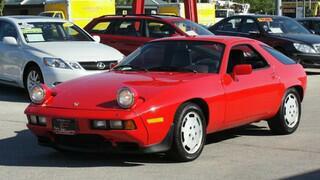 We look forward to seeing Jim and Amy in that 928S. Also new to the region are Richard and Jo Schumann. They are proud owners of two Porsches: a 2000 Cab 4 Oceans Blue with blue top and full wood trim interior, cashmere leather interior, and a 1997 911 Twin Turbo Guards Red with cashmere leather interior wood trim, wooden steering wheel - presently garaged, awaiting spring's arrival. Richard is retired. The Schumann’s are interested in tech sessions and driving events, as well as social events. The casual fish fry in early April was a hit with 51 members and guests attending. Read the recap of this event here. The DE tech session held at CS Motorsports in early May provided an orientation for members about drivers education. Read the recap, with photos, here. More than two dozens Porsches (and their drivers) came out to visit with military veterans on April 30 at the VA Center in Milwaukee. Read the story recap here, with photos. Check out the latest classifieds here. Remember, members can use this service at no cost. The classified page provides instructions on how to submit an ad. 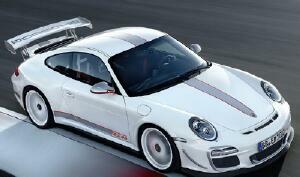 Read about the 2011 911 GT3 RS 4.0 in this autoblog. Thanks to member Mike Wiviott for the tip about this article. Prof. Ferdinand Porsche developed the first functional hybrid car. Read more here. Porsche on YouTube. Visit this YouTube site for some great videos from Porsche. Contact us – You're invited to contact board members, committee chairs and the newsletter editor with your questions or comments. Contact list here. Region resources. Looking for a form? Need information about helmets? Looking for a place to get some work done on your Porsche? Check out the Resources page in the left navigation section of the region website for a whole bunch of useful stuff. Your region website, www.porschepark.org is updated throughout the month. Bookmark it in your web browser "Favorites" and visit it often to stay current on what's happening.